A wave of clashes between Iraqi security forces and Sunni Muslim protesters has resulted in the deaths of at least 53 people. Violence sparked as the military raided a protest camp in Hawija, near Kirkuk. Tuesday’s unrest has become the deadliest in Iraq since December, when thousands of Sunni Muslims started protesting against Shiite Prime Minister Nuri al-Maliki accusing his government of discriminating against them. The violence has further escalated sectarian tensions and protests in the country and prompted two Sunni ministers to resign. Technology minister Abdulkarim al-Samarraie has also quit the Cabinet. 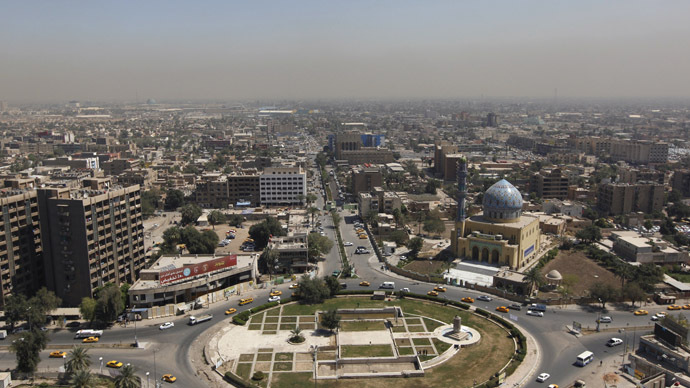 The unrest broke out before dawn on April 23, when security forces raided the Sunni encampment to search for fugitive militants who attacked a checkpoint near Hawija, north of Baghdad, several days earlier, the Ministry of Defense said. Military officials said they had warned camp residents of the looming raid and asked them to leave the area, some of whom did. Those who remained allegedly attacked the government troops. The army officers said 27 people – including two soldiers - were killed in the fighting and around 70 wounded, AFP reported. "When the armed forces started... to enforce the law using riot control units they were confronted with heavy fire," the Defense Ministry said in a statement, according to Reuters. In the ensuing conflict, security forces detained 75 protesters and confiscated a huge arsenal of weapons, including as rocket-propelled grenades, sniper rifles and AK-47s, AP reported. However, protesters claimed they were unarmed when the security forces attacked them. "When the Special Forces raided the square, we were not prepared and we had no weapons, they crushed some of us in their vehicles," protester Ahmed Hawija, a student, said, according to Reuters. The violence triggered revenge attacks. Thirteen gunmen were killed later on Tuesday as they attacked army checkpoints in the Al-Rashad and Al-Riyadh areas of Kirkuk province, Iraqi military officials said. The checkpoints were seized by Sunni militants for a short while, until they were retaken – reportedly by using helicopter gunships - by government forces. A curfew has now been imposed in the area, and the protesters' tents were burned down by government troops. Violence continued later in the day as at least ten worshippers were killed when mortar rounds landed on an Iraqi Sunni mosque in Muqdadiya in Diyala province, northeast of Baghdad, reported Reuters, citing police and medical sources. In a separate attack, protesters later killed six soldiers and kidnapped another one near Ramadi, west of Baghdad. 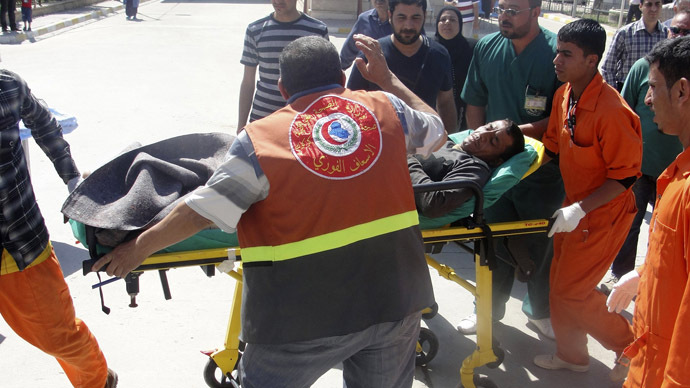 In the Sulaiman Bek area in Salaheddin province, gunmen carried out attacks on checkpoints sparking clashes in which five soldiers and one militant were killed, said Ahmed Aziz, a member of the local municipal council, AFP cited. Iraq has been wracked by violence since US troops withdrew from the country in 2011. Political power appears to have concentrated in the hands of a Shia political elite, resulting in widespread protest by Iraqi Sunnis and ethnic Kurds. Protests and violence are clearly a consequence of the US-led invasion 10 years ago, believes Jim Brann, an activist from the Stop the War coalition. “The installation of what you could call a Shia administration in Baghdad has clearly marginalized the large part of the Sunni population,” he told RT. 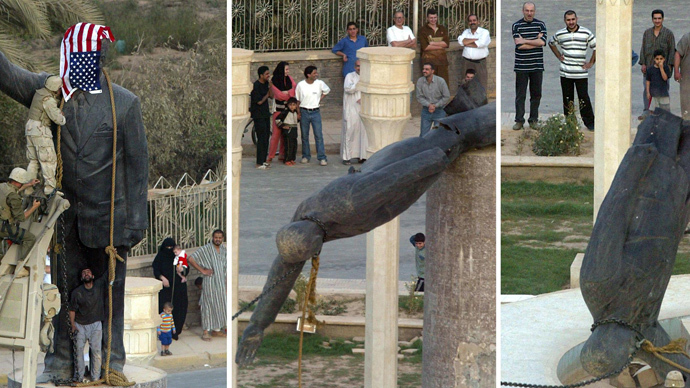 “The level of sectarian violence, for example, has no history like that in modern Iraq. It’s a permanent feature of the situation following the occupation,” he said. The run-up to the Iraqi provincial election, held on April 20, saw the violence escalate, with bombings reported nearly every day. Fourteen candidates, most of whom were Sunni, died. 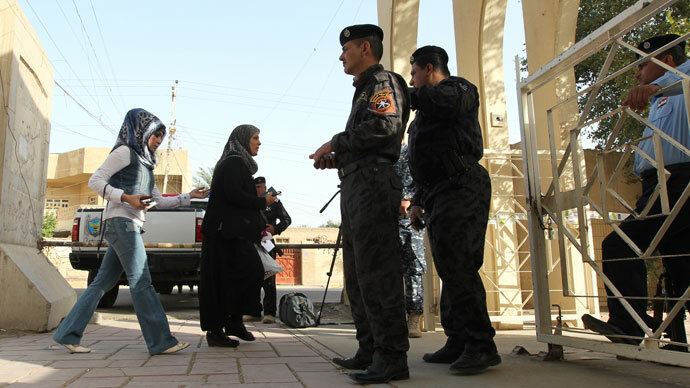 Eventually, 6 of Iraq's 18 provinces could not participate in the polls for security reasons. The latest outbreak of violence comes as the country awaits the results of the election.